When purchasing foundation, I always look for at least a medium coverage. It's my Minimum Coverage Requirement (MCR). I find that barely there color from light foundations aren't worth the money. I would much rather go foundation-less and use a little concealer instead. Medium coverage foundation is simply more dynamic. Often times, the formulas are buildable so I can even out my skin tone and hide blemishes as needed. Conversely, if I'm having a great skin day, I can add a little toner or primer to sheer out the color. These all have very good staying power for a busy day and wear well for my combination skin (oily t-zone and dry everywhere else). Burberry Fresh Glow Foundation - Luminous Fluid ($48 for 1 oz): This foundation is silky and feels light weight; it has a beautiful luminous "glowy" finish. A single layer of this foundation looks natural and is the perfect "no make up, make-up" look base. 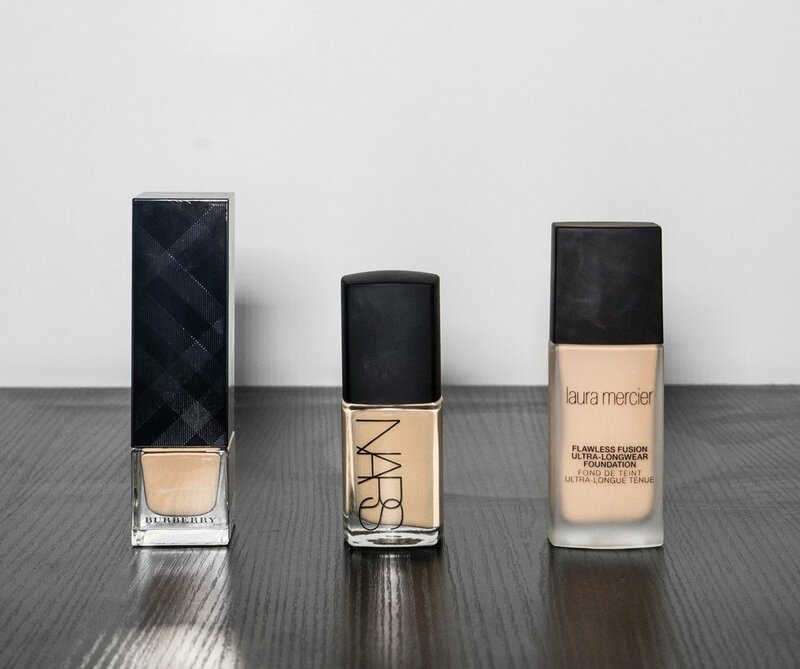 It takes little more time to dry than the average foundation. Unfortunately, it falls on the pricey-side but I justify it because I get a lot of use of it. It is my go-to everyday foundation for Fall, Spring, and Winter. The design of the bottle is also gorgeous and unique. I wear shade No. 32 Honey. NARS Sheer Glow Foundation ($42 for 1 oz): This foundation has a medium-light texture and goes on smooth. It dries matte , which is counter intuitive considering its name includes "Sheer Glow" . However, I find that the matte finish is REALLY helpful during the summer months. I don't like looking shiny and it wears well in heat and humidity. A con about this foundation is that it doesn't have a pump so product is exposed to air and will degrade faster over time. I wear shade Medium 3 Stromboli (specifically a touch darker than my normal skin tone as I am tanner in the summer). Laura Mercier Flawless Fusion Ultra Longwear Foundation ($48 for 1 oz): Honestly, this may be the best medium-full coverage foundation EVER. This foundation is highly pigmented (as it should be) and has a medium texture. The finish is a soft matte and slightly dry so I recommended moisturizing and using a primer beforehand. I love this foundation for not-so-good skin days; it does an excellent job of hiding hyper-pigmentation, blurring lines, and it lasts ALL DAY. I save this foundation for special occasions or if I'm going to be traveling from place to place throughout the day. I wear shade 3N2 Honey. Do you have combinations skin too? Or perhaps have found your go-to foundation? Let me know what you've tried in the comments below.